Your exhibition is a time to dazzle the world with all of the positive facets of your brand. Exhibitions can help you attract potential customers to your business.It’s only natural you want everything to go according to plan; it’s probable that you are investing a good chunk of your company’smarketing budget on it after all. This article will therefore help you gain some clarity on what will make your exhibition stand a success so you can achieve all your objectives. Firstly, you should know that the process can be divided into three phases. The first phase is before the exhibition, which includes the planning and design. The second phase is when you are at the exhibition itself. The final phase is after the exhibition has taken place. Within this article we will consider mainly the first and second stages so your exhibition stands the best chance for your company’s success. This one seems like an obvious one but it can be easily overlooked and undervalued. Rushing through the idea stage can cause great disappointment on the day and that is the last thing you want. With your company’s reputation on the line, you want a stand constructed and designed to a highly professional level and in an engaging way that won’t go unnoticed. First you want to write down your objectives or goals. These should encapsulate what you want to take away from the exhibition, be it tangible or intangible benefits. For example, do you want to boost sales for a new product or do you want to increase the positive perception of your brand? If you want to put on a special offer, consider when it will expire. All these elements accumulate into an effective planning process that ensures you keep in mind the reasons why you are exhibiting in the first place. This dictates the design and type of exhibition stands you choose. One of your main priorities is to create a stand that not only reflects youbrand’s personality but also jumps out from the sea of exhibitors. This can be a challenge, but with a little bit of brainstorming and thinking outside of the box, you can come up with some ingenious ideas. Think about any gadgets or quirky gizmos you want to incorporate to help show off your brand. Consider how to incorporate all the senses of the passersby; will they hear music first before seeing your stand? Will they see a flashy display or an animated screen? What do you have on display that your potential clients can touch and get a feel for? To heighten their overall experiencewhilst visiting your stand you want to make it as engaging and interactive as possible. They will want to stay forever if you can keep them interested! You can even tempt your customers in with a cup of coffee or have a competition running throughout the day. These are all great ways to make your stand really stand out. Keep people in the loop! 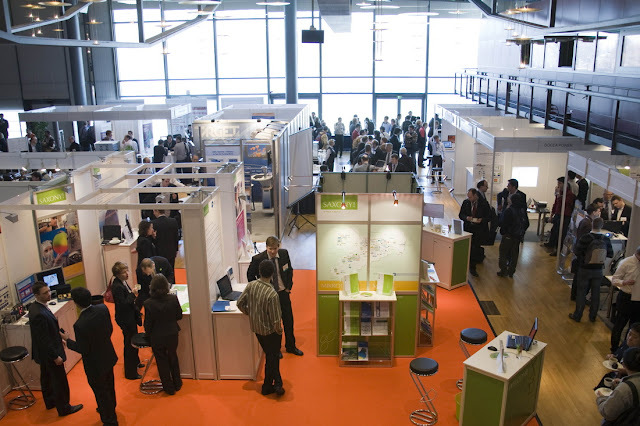 You don’t want to have gone through all of the effort and trouble of creating a winning exhibition stand and not alert people on your previous marketing channels about the event you are exhibiting at. This part doesn’t have to cost much but can have a positive impact on the success of the overall exhibition. So why not get on social media, blogs,and local press to let people know you are going to be there! Don’t forget the after part. Although the exhibition is over, there is still much to be done! To keep your leads interested you will need to maintain contact and keep communication going in some shape or form so your brand stays at the forefront of their mind. Following the process indicated in this article will help you achieve success during the exhibition. A successful exhibition not only attracts potential clients on your business but will also improve your brand’s reputation.